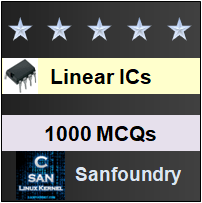 This set of Linear Integrated Circuit Multiple Choice Questions & Answers (MCQs) focuses on “Operational Amplifier Internal Circuit – 2”. 1. How are the arbitrary signal represented, that are applied to the input of transistor? (Assume common mode signal and differential mode signal to be VCM & VDM respectively). Explanation: In practical situation, arbitrary signal are signal are represented as Sum and Difference of common mode signal and differential mode signal. 2. How the differential mode gain is expressed using ‘h’ parameter for a single ended output? Explanation: Formula for differential mode gain using ‘h’ parameter model for a single ended output. = 801 = 20log⁡801 = 58.07 db. a) V01=-60[10 sin⁡Π(25t) ]-6.637[30sin⁡Π(50t) ], V02=60[10 sin⁡Π(25t) ]-6.637[30sin⁡Π(50t) ]. b) V01=-6.637[10 sin⁡Π(25t) ]-60[30sin⁡Π(50t) ], V02=6.637[10 sin⁡Π(25t) ]-60[30sin⁡Π(50t) ]. c) V01=-60[30 sin⁡Π(50t) ]-6.637[10sin⁡Π(25t) ], V02=60[30 sin⁡Π(50t) ]-6.637[10sin⁡Π(25t) ]. d) V01=-6.637[30 sin⁡Π(50t) ]-60[10sin⁡Π(25t) ], V02=6.637[30 sin⁡Π(50t) ]-60[10sin⁡Π(25t) ]. ⇒ ∣ADM∣ =100×0.12 = 12. 6. To increase the value of CMRR, which circuit is used to replace the emitter resistance Re in differential amplifier? Explanation: Constant current bias offers extremely large resistor under AC condition and thus provide high CMRR value. 7. What is the purpose of diode in differential amplifier with constant current circuit? Explanation: The base emitter voltage of transistor (VBE) in constant current circuit by 2.5mv/oc, thus diode also has same temperature. Hence two variations cancel each other and total current IQ become in depend of temperature. Explanation: For a large CMRR value, ACM should be small as possible. Explanation: The equation for total current is obtained by applying Kirchhoff’s Voltage Law to constant current circuit in differential amplifier. Explanation: The output current is reflection or mirror of the reference input current. Therefore, the constant current source circuit referred as Current Mirror. Explanation: If value of β is used in the equation, IC=β/(β+2)×Iref. It almost become unity and the output current become equal to reference current. 12. Calculate the value of reference current and input resistor for current mirror with IC=1.2μA & VCC=12v. Assume β=50.